Today on the blog I am hosting T.K. Thorne's Blog Tour for Noah's Wife, and I am sharing a fascinating interview that T.K. did with the Fixed Baroque blog in August. I also have a giveaway for an autographed copy of Noah's Wife & magnetic bookmark! Fixed Baroque: What inspired you to write from the perspective of Na'amah, Noah's wife? T.K. Thorne: I was completely blindsided by the idea. At a gathering of the Birmingham Arts Journal, a (wonderful) local poet, Irene Latham, explained that her inspiration to write a poem had come from her pastor’s observation that Noah’s wife was unnamed and received only a mention in one line of the Bible. As Irene related that fact, I sat there a bit stunned. It was as if a great blank slate appeared before me, and I had the opportunity to fill it. So I started by researching the flood and the culture of the time period. Before I began actually writing, I had no idea about the character of Noah’s wife, but I read that the traditional Jewish name for her was Na’amah. This is probably based on the fact that a woman with this name is given a brief paragraph in the same Genesis chapter as the flood story, relating only her lineage from Adam, but no reason what her relationship to the story might have been. Looking up the name, I found it meant “beautiful or pleasant.” That seemed like a starting point, so I typed, “My name, Na’amah, means beautiful or pleasant.” Na’amah hastily added, “I am not always pleasant, but I am beautiful,” and she proceeded to tell her story. It never felt as though I had much choice about it from there and sometimes I laughed aloud or blinked in surprise at what she said or did. Fellow novelists will understand this; others might think I need treatment. FB: In terms of her mentions in ancient texts, how much do we know about Na'amah? What, if any, facts about her influenced the way you wrote her character in Noah's Wife? FB: Throughout the novel, Na'amah is both mocked and praised for her mind. Though some call it a "wounded mind," for every disservice she suffers as a result, it affords her a unique ability. What inspired you to write Na'amah as having Asperger's Syndrome? FB: Because of Na'amah's keen senses, she could feel impending disaster long before other people. Considering this, why was it important for her to embrace her title as Priestess to have the vision of disaster laid out before her? TK: Not only was Na’amah an Asperger savant, she also had synesthesia, a type of “crossed wiring” in the brain where people may “see” sounds or “hear” colors. Although everyone on the autistic spectrum is unique, a hypersensitivity in one of the senses is not that uncommon. I played with this idea, extending Na’amah’s hypersensitivity to sound to include the infrasound—low frequency vibrations normally below the human audible range. Infrasound has been known to cause symptoms of nausea, discomfort, and wavering in the peripheral vision. It is theorized that infrasound is produced prior to earthquakes, and that this might be the explanation as to why some animals seem to predict major quakes. Na’amah’s nature made her uncomfortable with anything strange or different from what she was accustomed to. Her journey across the Land of Mothers was forced on her, as was the role of priestess, which she rejected. But a time came when she realized that rejection had a price that she was not willing to pay, and she forced herself to accept her responsibility. This was part of her real journey—the same one we all face—to become her potential. FB: Noah's Wife is a feminist retelling of the classic Noah's Ark story. What were some of the challenges of writing a feminist story that is set in a time when the concept of feminism did not yet exist? My story took place in 5500 BCE before the written word. I chose that date because geologists believe that is the approximate time that a cataclysmic event caused the collapse of a natural land barrier between the Mediterranean and the Black Sea (which was a fresh water lake up until that time) resulting in a great flood that affected a large portion of the Middle East. So my challenge was to fill out a world and culture from what clues we have in the historical and archeological records. My imagination came into play as well, of course, and I did take literary license. One area in which I did so was to foreshadow the coming historical conflict between the female and male divine. FB: Without spoiling too much of the story... The novel deals with some heavier issues. What were the biggest challenges of writing these difficult scenes? TK: It is a common directive to writers to “write what you know,” and I agree with that in the sense that it is difficult to deeply portray a totally unfamiliar perspective. That said, “what you know” can be expanded by research and by opening yourself to the experience of others. A good writer is, at heart, an observer with a developed capacity for empathy, as well as imagination. I often draw on my years as a police officer where I encountered a wide range of people in intense situations. The human experience transcends time. Cultures differ, but our emotional responses are based on hundreds of thousands of years of evolution, and “civilization” is but a thin veil over that. FB: The novel acknowledges the conflict between matriarchal and patriarchal religions that would have been present during the time. Though Na'amah, her family, and her friends favored the Goddess, Noah credits the rainbow to God in the end. Why is this? TK: Throughout the book, Noah has a strong belief in the gods—Father god and Mother goddess—as creators and beings who interact with his physical world. In many ancient cultures, the earth, sea, and the animals belonged to the realm of the goddess, and the heavens and sky to the god(s), hence a rainbow in the sky would be a sign from Father god. FB: I'm not religious and, finding that religiosity was not a prerequisite to enjoying the book, I thoroughly loved reading Noah's Wife. What would you say to those who would look at the book and think they wouldn't enjoy it because they aren't religious? TK: It is my hope that both religious and nonreligious people will find the story engaging. It is a novel, and that is its intent, but many people along a wide spectrum of religious beliefs have found it an interesting alternative perspective of a historical or mythical story that is an important part of our inherited culture. I don’t consider myself “religious” either, but spiritual growth, for me, is about finding meaning in our lives and is not necessarily hooked to religion or even a theist belief. Perhaps discovering the “divine” is as simple as acting with compassion and responsibility toward our fellow humans and our world. Compassion and responsibility are attributes we can learn and develop; life is a journey, and in that journey we can find strengths and power within us that we never dreamed existed. FB: Your next book will be Angels at the Gate: The story of Lot's Wife. What can you tell us about the story plot-wise? 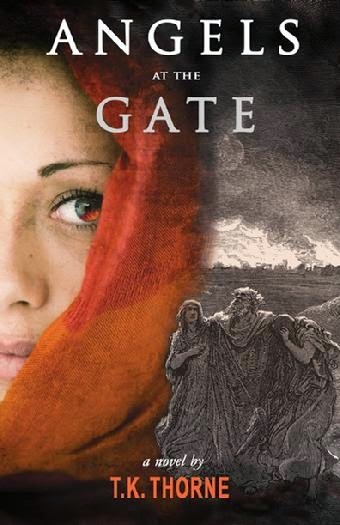 Will Angels at the Gate appeal to the same readers that Noah's Wife appeals to or will it attract a different audience? When will Angels at the Gate be released? If the path of obedience is the path of wisdom, it is one not well worn by my feet. I am Yildeth, daughter of the caravan, daughter of the wind, and daughter of the famed merchant, Zakiti. That I am his daughter, not his son, is a secret between my father and myself. This is a fine arrangement, as I prefer the freedoms of being a boy. For more information on T.K. Thorne, check out her author website and like her author fan page for the latest updates. LISTEN TO THE AUDIOBOOK SAMPLE. A ForeWord Reviews BOOK OF THE YEAR for Historical Fiction. Noah’s Wife transports readers to an ancient time and place, while delving into issues that affect our contemporary lives--family relationships, autism, religious freedom, kidnapping and cultural change. A biblical novel that is not “Christian Fiction,” T.K. Thorne’s version weaves myth, history, and archeological findings with her vivid imagination, wisdom and humor into an epic tale you will not forget. Told from the unique perspective of a young girl with what is now called Aspergers, this is the story of Noah’s completely unknown wife, Na’amah. Na’amah wishes only to be a shepherdess on her beloved hills in ancient Turkey— a desire shattered by the hatred of her powerful brother and the love of two men. Her savant abilities and penchant to speak truth forces her to walk a dangerous path in an age of change—a time of challenge to the goddess’ ancient ways, when cultures clash and the earth itself is unstable. When foreign raiders kidnap her, Na’amah’s journey to escape and return home becomes an attempt to save her people from the disaster only she knows is coming. • Scientists (including Robert Ballard, the explorer who found the sunken Titanic) discovered evidence that the Black Sea was once a fresh water lake that flooded in a cataclysmic event around 5500. • The oldest known worshipped deity was female! The role of the feminine in the divine was entwined with early Judaism and keeps reappearing throughout history. • One in every 88 persons has a form of autism. The choice to make Noah’s wife an Asperger savant stemmed from personal experience in the author’s life and gives the story a distinctive perspective. “. . . a terrific storyteller.” — Sena Jeter Naslund Bestselling novelist, Ahab's Wife, Four Spirits, etc. TK Thorne was the first Jewish woman to become a police officer in Birmingham, AL (USA). 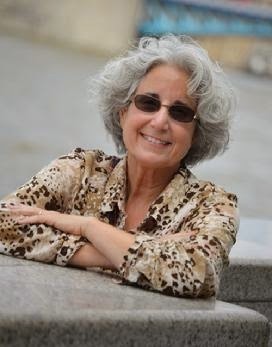 She retired as a captain and currently serves as executive director of the city’s business improvement district—both careers providing fodder for her writing. 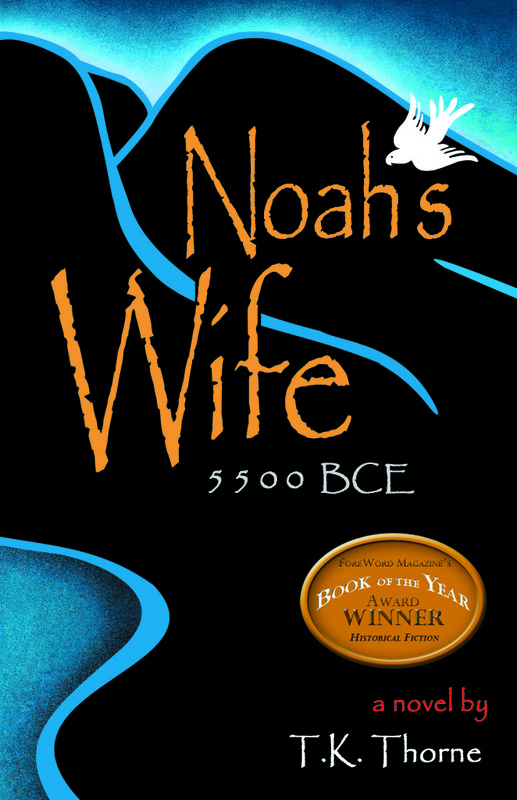 Her debut novel Noah’s Wife won ForeWord Reviews’ “Book of the Year” for historical fiction. The New York Post featured her book Last Chance for Justice: How Relentless Investigators Uncovered New Evidence Convicting the Birmingham Church Bombers on their “Books You Should Be Reading” list. A short film from her screenplay Six Blocks Wide was a semi-finalist at “A Film for Peace Festival” in Italy. She describes herself as a writer, humanist, dog-mom, horse-servant, and cat-slave. Her next novel, Angels at the Gate, published by Cappuccino Books, will be released in March 2015. 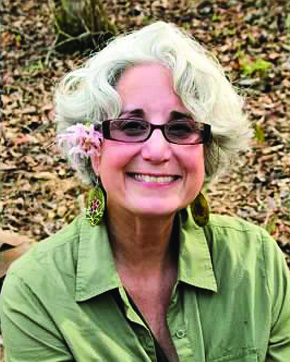 She blogs at www.TKs-tales.com and her web site is www.TKThorne.com. You can also find her on Facebook, Twitter, Pinterest, and Goodreads. Sign Up for T.K. Thorne's newsletter. To enter to win an Autographed copy of Noah's Wife & magnetized bookmark, please complete the giveaway form below. – Giveaway ends at 11:59pm on December 19th. You must be 18 or older to enter. – Giveaway is open to residents of the US only.